A veteran of 14 seasons in Formula One, Fisichella drove for some of the best and some of the worst teams in the sport. However, with only three wins to his name he is often criticised for not making the most of his opportunities. Having karted throughout the 1980s, he graduated to Italian Formula 3 in 1992 and by 1994 had won the championship. He briefly left single seaters to drive in the DTM championship for Alfa Romeo where he was a consistent qualifier but often let down by the car's reliability. In 1996 he made his F1 debut with Minardi but, due to a lack of personal funding, was dropped after eight rounds. He was signed to partner Ralf Schumacher at Jordan in 1997 and it proved to be his breakthrough year, as he took two podiums and outscored his team-mate comfortably over the season. At the German Grand Prix he was a genuine contender for victory but a puncture put an end to his race. His performance didn't go unnoticed, however, and for 1998 he was snapped up by Benetton. The car proved competitive in the first half of the season and a victory looked possible at the Canadian Grand Prix until a gearbox problem slowed him down. In 1999 his mixed form continued but the car started to drift further off the pace and by 2002 he had left the team to return to Jordan. His first win came in 2003 at the chaotic Brazilian Grand Prix when, amid huge confusion, Kimi Raikkonen was initially named the victor. A successful appeal by Jordan followed and Fisichella was presented with the trophy at the next round at Imola. A season at Sauber followed in 2004 before he moved to Renault, placing him in a championship winning car for 2005 and 2006. However, his team-mate Fernando Alonso dominated at the team and Fisichella took just two wins in two years while Alonso took 14. In 2008 he moved to Force India, but instead of fighting for points he was struggling to keep the car off the back row of the grid. The team came on leaps and bounds in 2009 and he very nearly won the Belgian Grand Prix after taking a shock pole position in qualifying. An offer to replace the injured Felipe Massa at Ferrari then followed and Fisichella, in pursuit of his boyhood dream of driving for the team, snapped it up. However, he struggled to come to terms with the car, which was one of the most difficult to drive on the grid, and didn't score a single point in the five races he took part in. It was a massive disappointment and meant that his career both peaked and fell apart simultaneously. In 2010 he accepted a role as Ferrari's third driver, but with Jules Bianchi named as a fellow reserve in 2011 and test drivers all but redundant in modern F1, it seems unlikely that he will ever return to a race seat. He has often performed well in slower cars but when given the opportunity at Renault in a genuine championship contender he came up short compared to Alonso. His first win at the 2003 Brazilian Grand Prix in a Jordan that was well off the pace. The victory marked something of a turning point in his career as he then moved to Sauber and eventually to Renault. His debut with Ferrari at the Italian Grand Prix proved to be a huge anti-climax as he finished outside the points and well off the pace of his team-mate Kimi Raikkonen. He even finished behind his ex-Force India team-mate Adrian Sutil. "If I had $10 million I'd stay at home and watch F1 on TV." Fisichella's response to suggestions he was paying for a drive at Force India. "This is my third stint under the same roof, I can speak to the walls and they will answer back to me." On returning to Jordan's old factory as a Force India driver. Trivia From 2006-2009 he backed the Coloni GP2 team that ran under the Fisichella Motor Sport name. 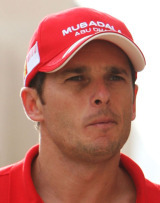 The team reverted to the Scuderia Coloni name in 2010 when Fisichella lost his drive in F1.